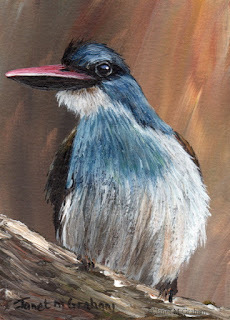 Blue Breasted Kingfisher measures 2.5 x 3.5 inches and is painted on Colourfix Smooth paper. 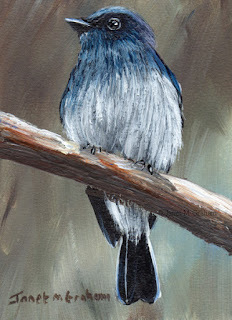 Indigo Flycatcher measures 2.5 x 3.5 inches and is painted on Colourfix Smooth paper. Chestnut Headed Tesia's are found in China, India, Laos, Myanmar, Bangladesh, Bhutan, Nepal, Thailand and Vietnam. Chestnut Headed Tesia measures 3.5 x 2.5 inches and is painted on Colourfix Smooth Paper. 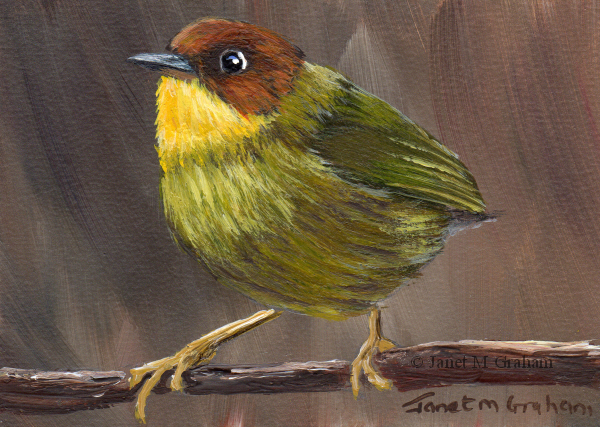 Green Shrike Babbler measures 3.5 x 2.5 inches and is painted on Colourfix Smooth Paper. Many thanks to Francesco Veronesi for the reference photo.. Tranquil River measures 6 x 6 inches and is painted on Colourfix Smooth Paper. Many thanks to Sandie Bell for the reference photo. 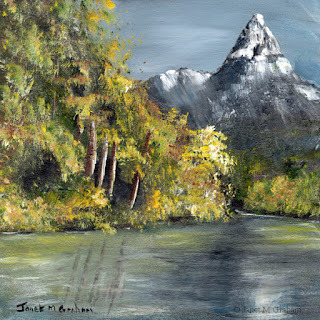 Snowy Peak measures 6 x 6 inches and is painted on Colourfix Smooth Paper. This one rather fun to paint - everything just seemed to work. Abert's Towhee is found in Southwest North America. The measure around 21 - 25 cm in length and weigh between 40 - 54 grams. 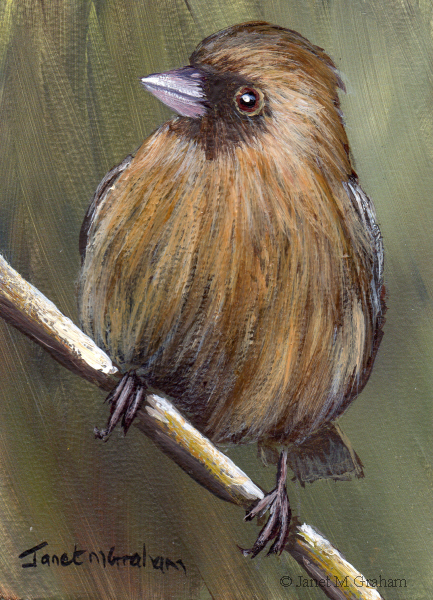 Abert's Towhee measures 2.5 x 3.5 inches and is painted on Colourfix Smooth Paper. I love the red feathers of this one. The Scarlet Sunbird is also known as the Javan Sunbird and is found Javan and Bali. Scarlet Sunbird measures 2.5 x 3.5 inches and is painted on Colourfix Smooth paper. This is Max - he is now 10 months old and he makes me laugh everyday with his antics. 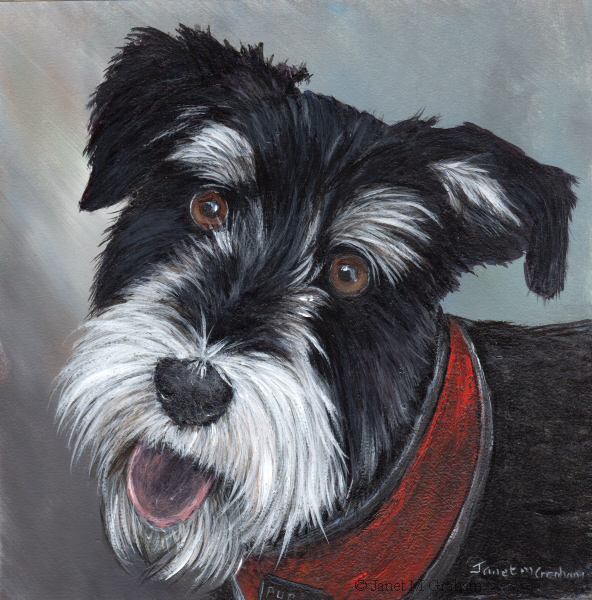 Miniature Schnauzer measures 6 x 6 inches and is painted on Colourfix smooth paper. I love how this cub is looking up. 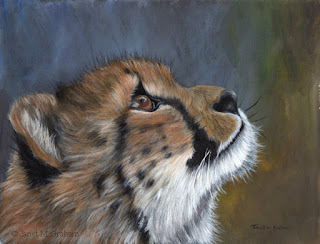 Cheetah Cub measures approx. 11.61 x 8.85 inches and is painted on Colourfix Smooth Paper. Many thanks to Tazi Brown for the reference photo. I love the colours of this ones feathers. 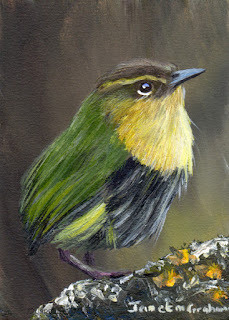 As the name suggest, these birds are found in New Zealand. They are quite small with the males weighing only about 16 grams and females 20 grams. 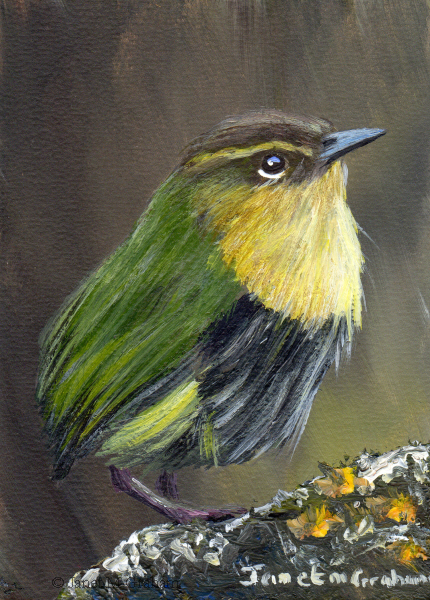 New Zealand Rock Wren measures 2.5 x 3.5 inches and is painted on Colourfix Smooth paper. 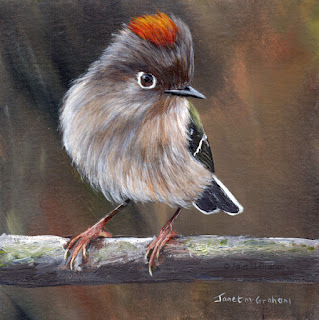 Ruby Crowned Kinglet No 5 measures 6 x 6 inches and is painted on Colourfix Smooth paper. I love this one's vibrant orange feathers. 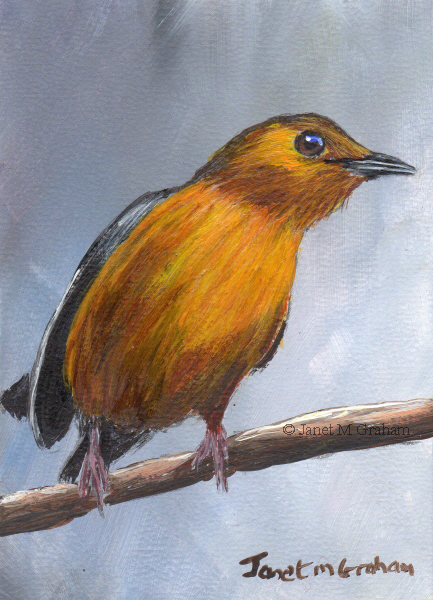 The Red Capped Robin Chat is also known as the Natal Robin and are found in Africa. 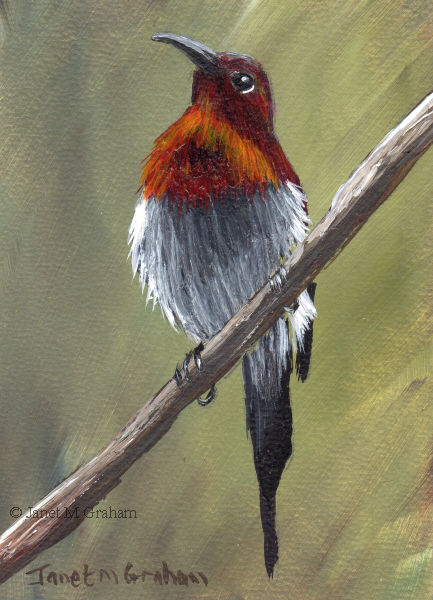 Red Capped Robin Chat measures 2.5 x 3.5 inches and is painted on Colourfix SMooth Paper. 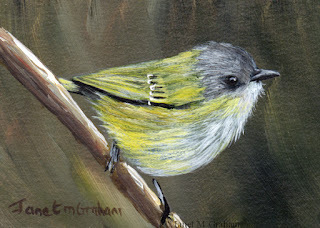 I love painting yellow feathers so couldn't resist painting this one. Really pleased with how it turned out. Hooded Warbler No 2 measures 6 x 6 inches and is painted on Colourfix Smooth Paper. 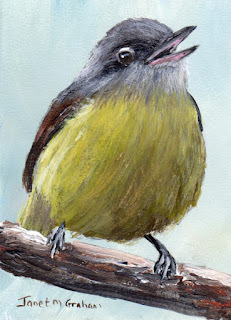 I love how this one is singing away on the branch. Warbling Vireo measures 2.5 x 3.5 inches and is painted on Colourfix Smooth paper. 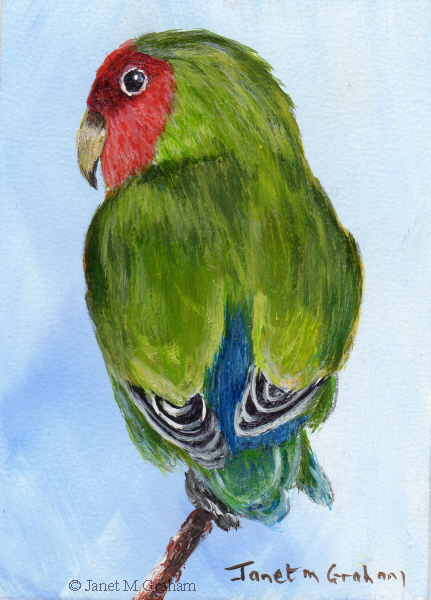 Rosy Faced Lovebird measures 2.5 x 3.5 inches and is painted on Colourfix Smooth Paper. 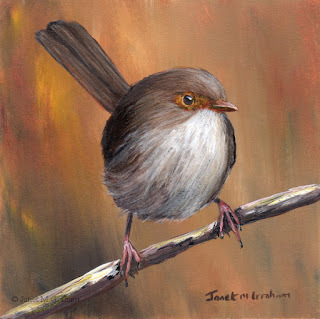 The little wren is one of my favourite birds to paint and I love looking out for them on my walks in my area. Superb Fairy Wren (female) measures 5 x 5 inches and is painted on Colourfix Smooth paper. 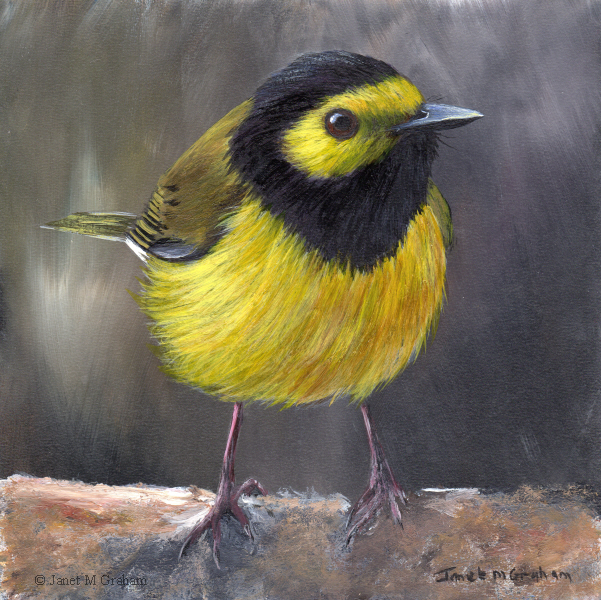 Many thanks to Patrick Kavangh for the reference photo. 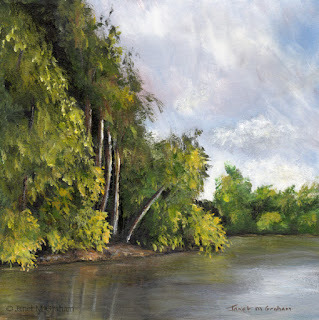 The painting is available for purchase through my Esty Shop. To view the listing, please click here.